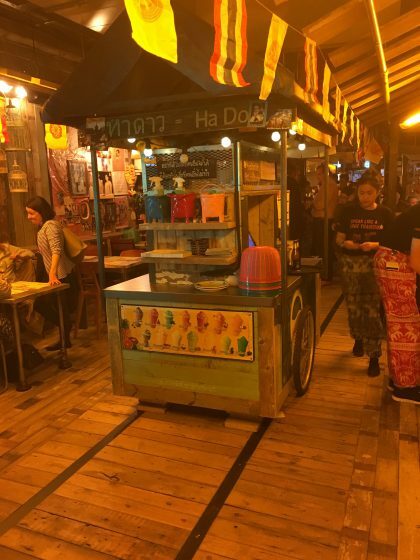 In May I was invited to the launch of a new restaurant in Guildford, specialising in Thai style street food. 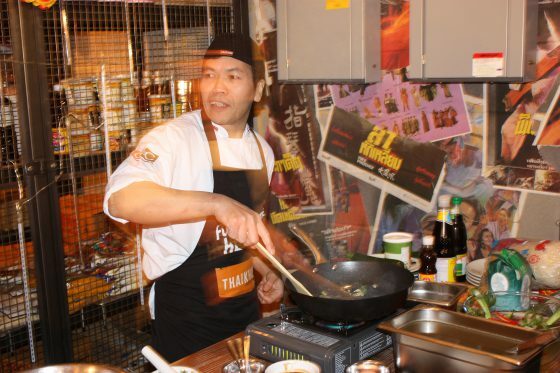 Thaikhun (pronounced Tycoon) are a small chain with 8 branches across the UK. 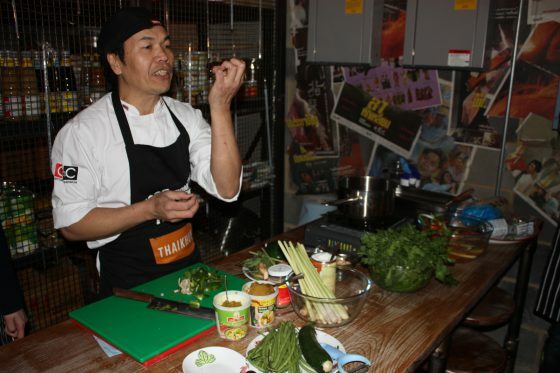 I had a lovely evening at the launch, meeting the joint owner Kim Kaewkraikhot. We talked all about her life in Thailand, making award winning noodles. 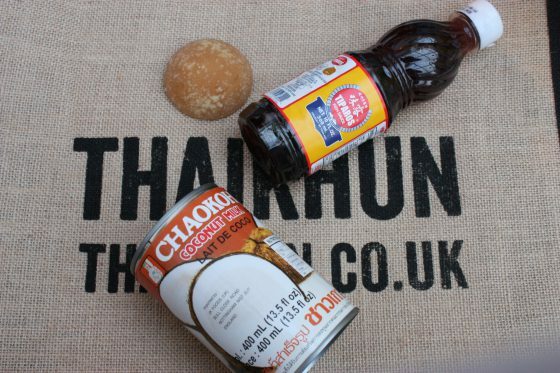 How when her now business partner, tasted them, he was inspired to invest in her and develop Thaikhun in the UK. Such an interesting story! The decor of the restaurant is fantastic. Authentic and fun it’s designed especially to remind diners of the street markets of Kim’s home country. She even explained how she hand picks many of the items used for decoration on her trips back to Thailand. It was clear to see the time and thought that had gone into it. A replica of the cart Kim originally sold her food from. 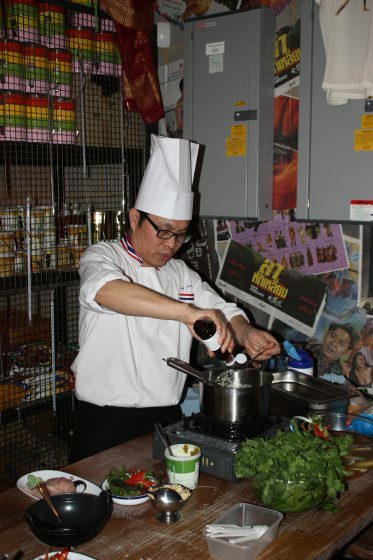 Every restaurant has one to represent Thaikhun’s humble beginnings. See the ‘train tracks’ on the floor? Many of the markets in Thailand are built over train tracks and have to be picked up periodically to let the trains through! 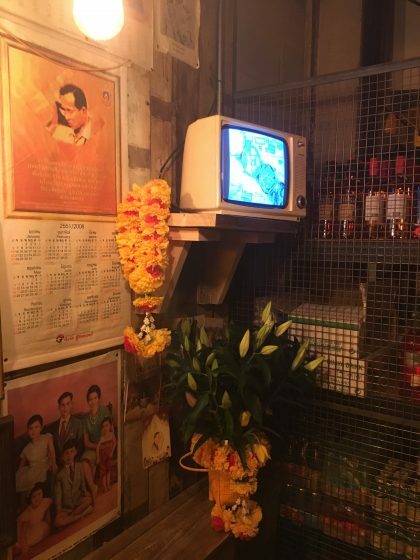 The decor is authentic down to the old sets playing Thai TV in the corner! 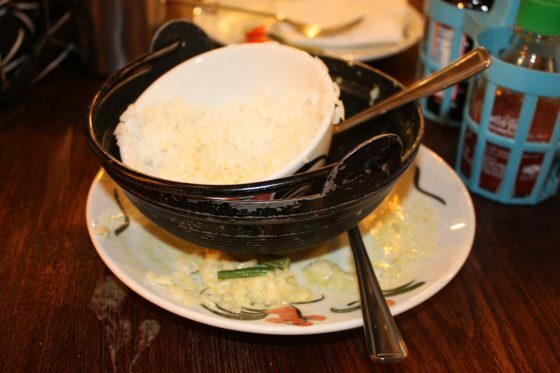 I love Thai food, but I don’t get out to eat it much since moving away from London. 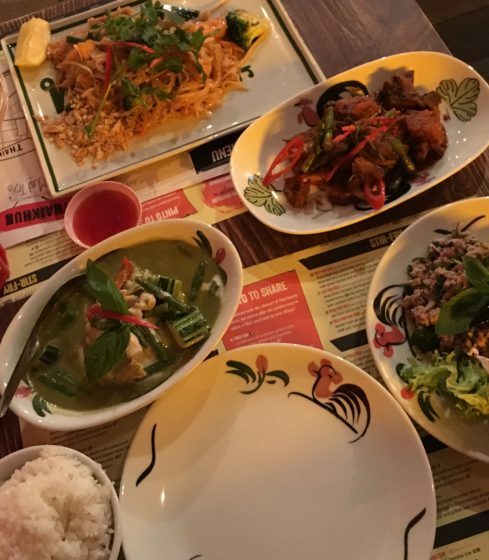 The food I tried at Thaikhun was hands down some of the best I’ve had. 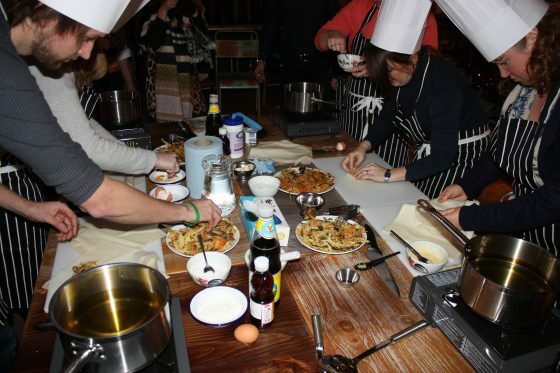 Noodles, of course, but also curries, salads, various stir fried dishes and options from the grill. The enthusiastic staff seemed keen to explain that Thai food doesn’t just begin and end with Pad Thai. And I’m so glad they did. It’s the thing I always order in Thai restaurants, partly because I love it and partly because it’s the dish I’m most familiar with I guess. However, when I was given the Pork Belly with Green Beans in Red Curry Sauce (Moo Prik King), well, all that changed. 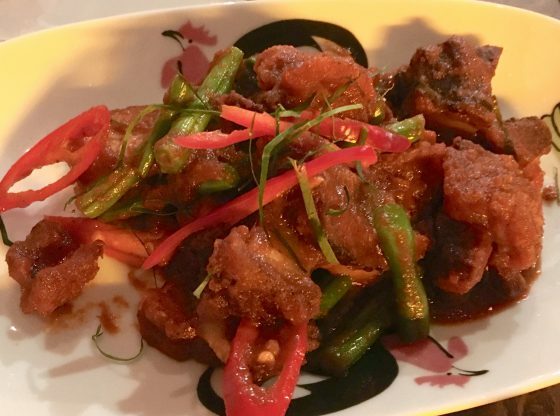 Juicy pork, with a flavoursome heat and crunchy beans! I could have eaten a bucket of just that. With some sticky rice perhaps. Delicious! 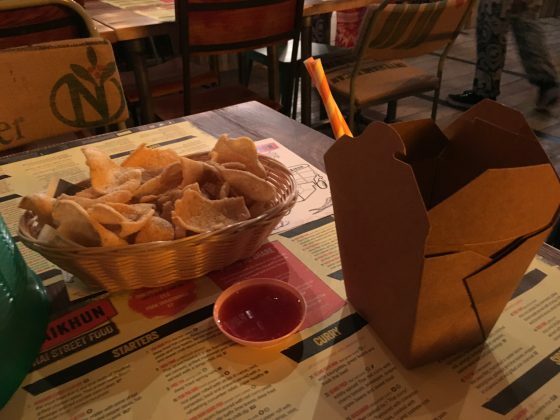 Starting the meal with spicy crackers and a cocktail in a box? Yes please! A selection of starters. The Fishcakes were gorgeous little morsels! My new favourite Moo Prik King. Pork Belly with Green Beans in Red Curry Sauce. Amazeballs! While I was chatting to the management I asked whether they felt the restaurant was suitable for children (once a mummy blogger always a mummy blogger after all!) I could see there were plenty of high chairs and a changing facility, but wondered if the busy decor and bustling feeling might be too much for some children. They told me that they were actually working on their children’s offering and asked if I would be willing to come back when it was launched to let them know my thoughts. I said I’d love to. 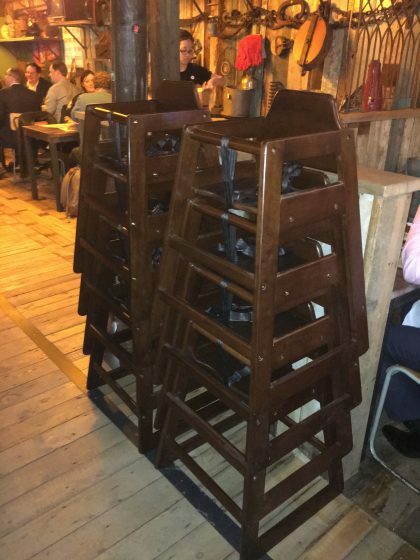 Plenty of (decent) high chairs! I have to admit I was concerned whether Oscar would cope with the busy decor and the unusual food. 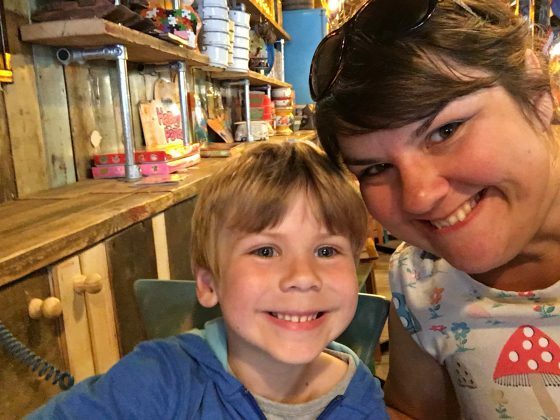 His autism means we can never be sure how he’ll cope in new places, so to be sure I could offer a fair review I actually took him for lunch a few weeks beforehand. 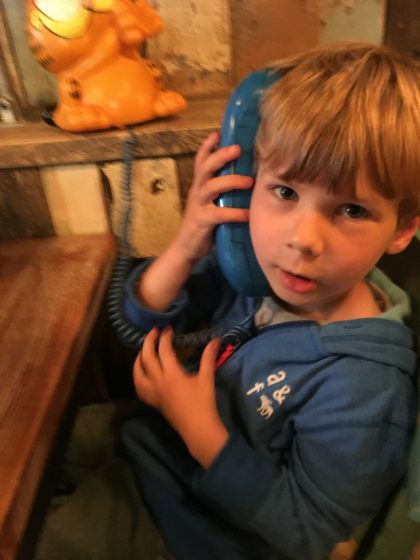 He did brilliantly and loved the busy decor, especially the Garfield Phone! We ordered the PopCorn Chicken from the old children’s menu and I gave him some of my rice. He tried it all, including the spicy prawn crackers. I actually thought the children’s options were pretty good (and tasted lovely!) The only niggle was that I had to ask three different people to bring him crayons to colour his menu mat and by the time they did he’d lost patience and wanted to leave. What else do you do with the cloche over the condiments? The Garfield phone went down a storm! Going back he was much calmer and knew where he wanted to sit. It was interesting to see the new menus. They had retained the Pad Thai and Pop corn style chicken and rice options, but had introduced a Mix n Match option. 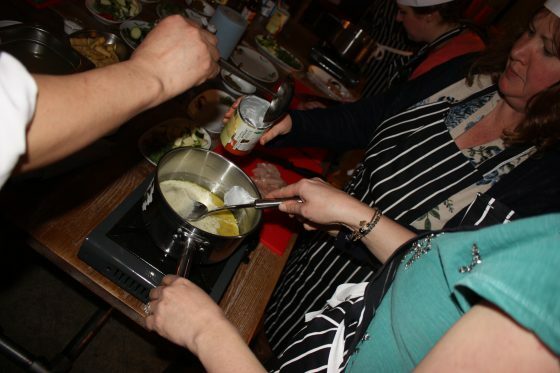 I loved this idea as it allows children to pick the elements they liked and mix with a choice of three sauces, making the dish as flavoursome or not as taste dictates. Brilliant! All children’s meals start with crudités (vegetable sticks), then I chose him the plain noodles, the char grilled chicken and a nut free satay sauce. My thinking was that he likes chicken, occasionally eats noodles and adores peanut butter! It came, not on a plate as before, but in a yellow version of the compartmentalised school dinner tray, with plastic cutlery. I couldn’t really work out why, although I know some children prefer the compartmentalised approach to food, so maybe it was that. I have to say it didn’t really add anything to the experience for us. The chicken was lovely and the noodles were, well, noodles. He wouldn’t add the sauce to them, which was a real shame, as I think it would have been much tastier if he had! Ahh well that’s my boy. Maybe next time. But all in all I loved this idea. 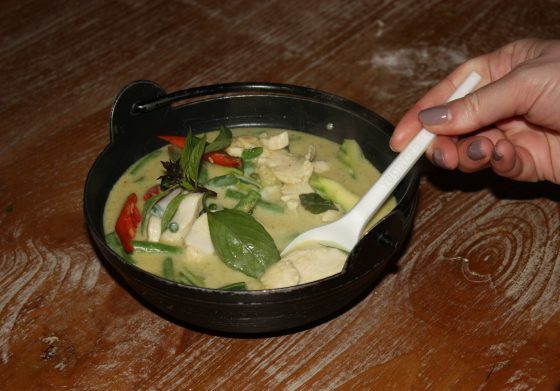 Children love control over the food they eat and this hands it to them nicely. 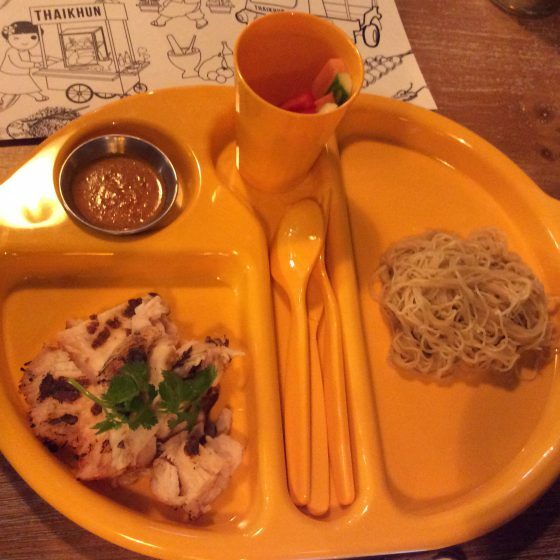 Children’s meals come in these trays. Great if your child likes to keep their food separate, but plenty of room to mix it up if they would prefer. 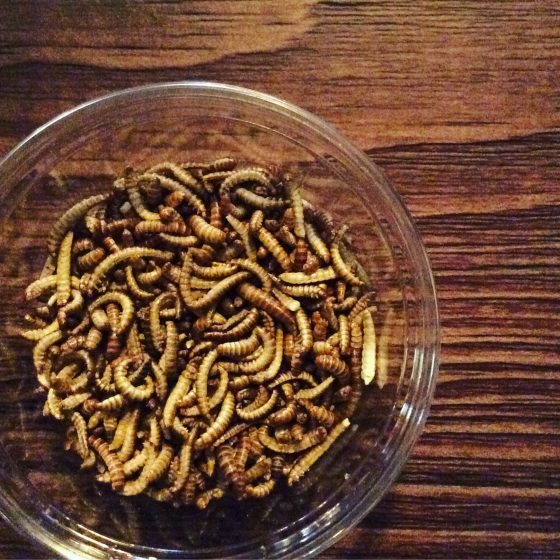 As a bit of fun the restaurant also serve all children a small pot of ‘creepy crawlies’ or Buffalo Worms as they’re actually called, to try. Oaty in flavour they were perfectly inoffensive, but Oscar would not touch them, telling me “You don’t eat worms Mummy!” Far too sensible my chap 😂. The dessert for the set childrens menu was a Mini Milk Lolly. Which I have to say I wasn’t sure about. A branded lolly, very squarely aimed at young toddlers, in a culturally specific restaurant, after a meal aimed, I would say, at children of all ages. It felt a bit odd to me, but the boy didn’t seem to mind and it would have meant we could have taken it with us if we’d needed to leave in a hurry, something I’m always appreciative of! “You don’t eat worms mummy!” Buffalo Worms to try. 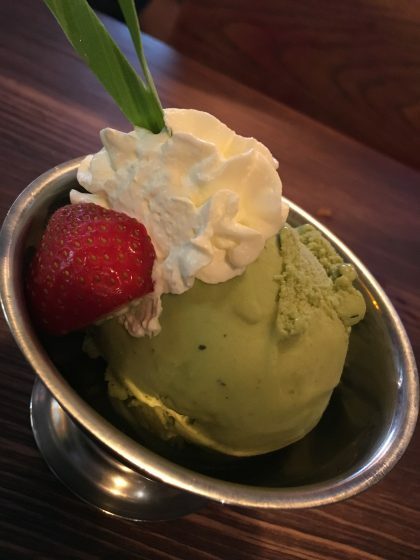 The Boy got a Mini Milk, I got Green Tea Ice Cream. Mummy wins this one kiddo! 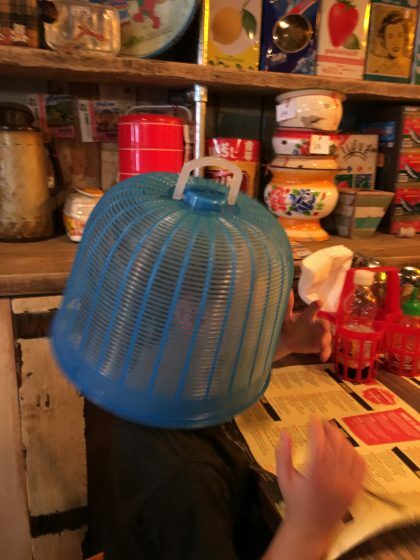 I like Thaikhun child’s offering. 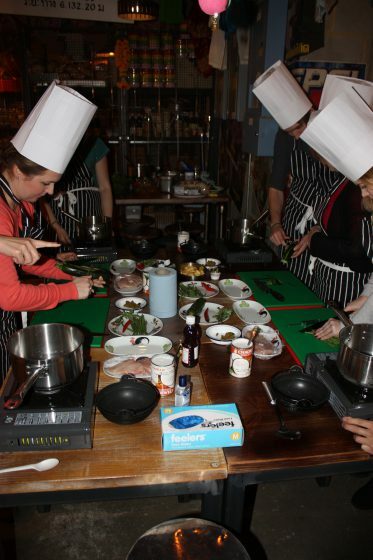 The food is well pitched and can be adjusted to how adventurous the child is feeling! The only thing I was a little disappointed with was what came with the food. 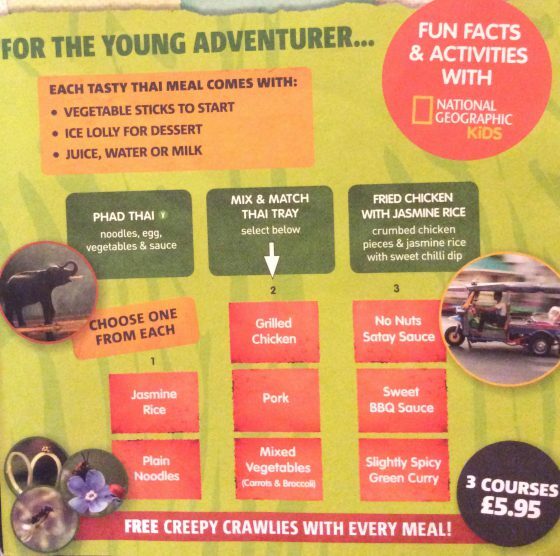 On the new Menu it talks about “Fun Facts and Activities with National Geographic”. I like this idea. 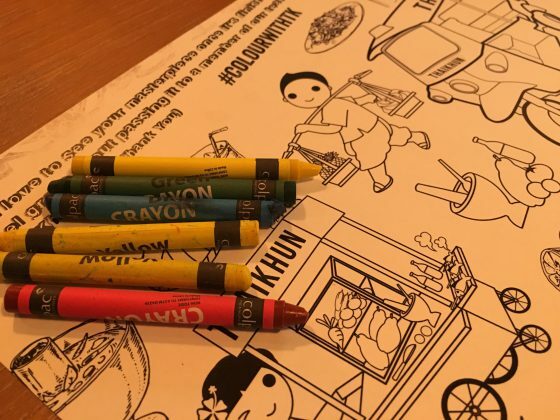 Something more than just a colouring option would definitely raise it above other children’s dining options on the high street. However other than the worms, we saw nothing of these. Oscar was just bought an old menu to colour, albeit much quicker than before. It was perfectly nice and all and I don’t have anything against colouring as an activity. I don’t know, maybe I was just expecting something a little bit different. Maybe I was just expecting more than an old menu and some crayons. Would I recommend it as somewhere to take children? I like that the children’s menu is flexible and the staff have always been unremittingly helpful and warm. If you have a child that is happy to veer away from the beige choices of potato based meals, then I would absolutely recommend it. 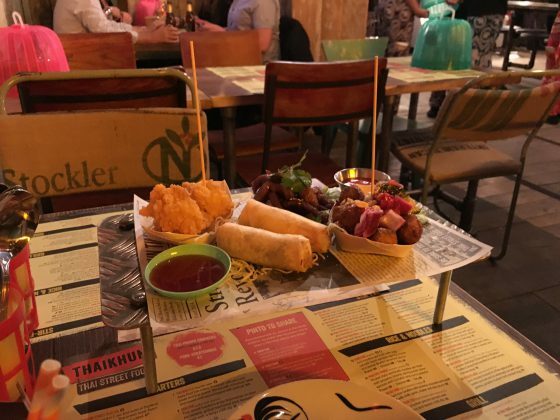 Thank you so much to Thaikhun for their generous hospitality. I was not paid to write this review and as always all opinions are my own. All my fellow bloggers appear to be pregnant at the moment, so pregnancy talk is everywhere on my social media! Swollen ankles, back ache, sciatica, the lot! And then the other day someone mentioned how hungry she is all the time and that took me right back! In my first two trimesters I ate much less than usual. I just wasn’t as hungry at all. But then in the third trimester I was ravenous constantly. Particularly in the mornings. At the time I worked an hour and a half away and to keep me going on the train I started taking a cereal bar with me. And then it was two. And by the end I was packing a picnic! And eventually shop bought cereal bars just weren’t doing it for me any more. So I found a recipe to make my own. Packed with much more goodness than commercially produced ones, they (along with the satsumas I was craving), kept me going until I got into work. Just! Me at 34 weeks pregnant. Already very swollen and very hungry! And I hadn’t thought about them for aaaaaaaages, until talking to my hungry pregnant friend the other day. So I thought I’d share the recipe with you. 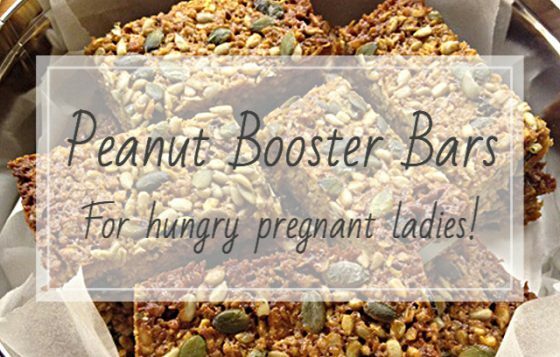 They’re based on a River Cottage recipe, are utterly addictive and not just for pregnant ladies! Line a square baking tin. 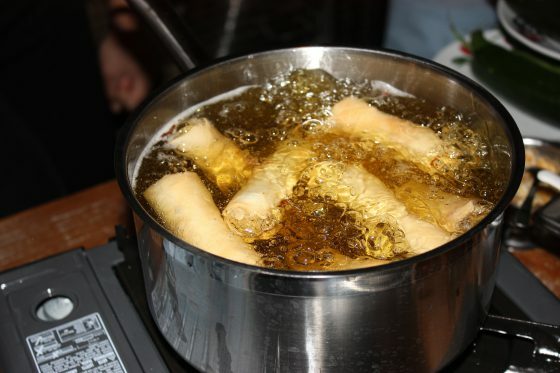 Put the butter, sugar, peanut butter, honey and grated citrus zests in a deep saucepan over a very low heat. Leave until melted, stirring from time to time. 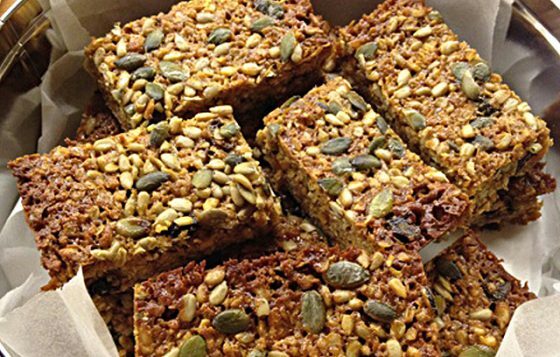 Stir the oats, dried fruit and three-quarters of the mixed seeds into the melted butter mixture until thoroughly combined. Spread the mixture out evenly in the baking tin, smoothing the top as you go. Scatter the remaining seeds over the surface and trickle with a little more honey. Place in an oven preheated to 160°C/Gas Mark 3 and bake for about 30 minutes, until golden in the centre and golden brown at the edges. 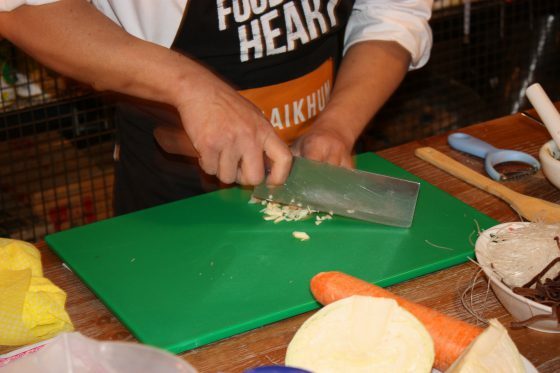 Leave to cool completely in the tin (be patient – it cuts much better when cold, in fact I used to keep mine in the fridge), then turn out and cut into squares (or in my case great big wodges) with a sharp knife. These bars will apparently keep for 5-7 days in an airtight tin. Or in our house, a couple of days. Ish. 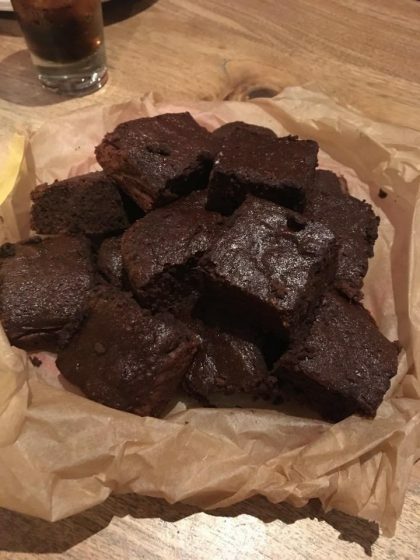 Yes they have some sugar in them, but do you know what, these little beauties did me a real solid in what was a pretty difficult time in my life. So I can’t help but love them. Give them a go and let me know what you think! This last weekend was just superb weather. A bit of sunshine can make all the difference to how everything feels. And with the good weather should always come BBQ. I love barbecued food and would eat it every day if I could. Two years ago we bought a proper beast of a grill. None of this gas fired nonsense. 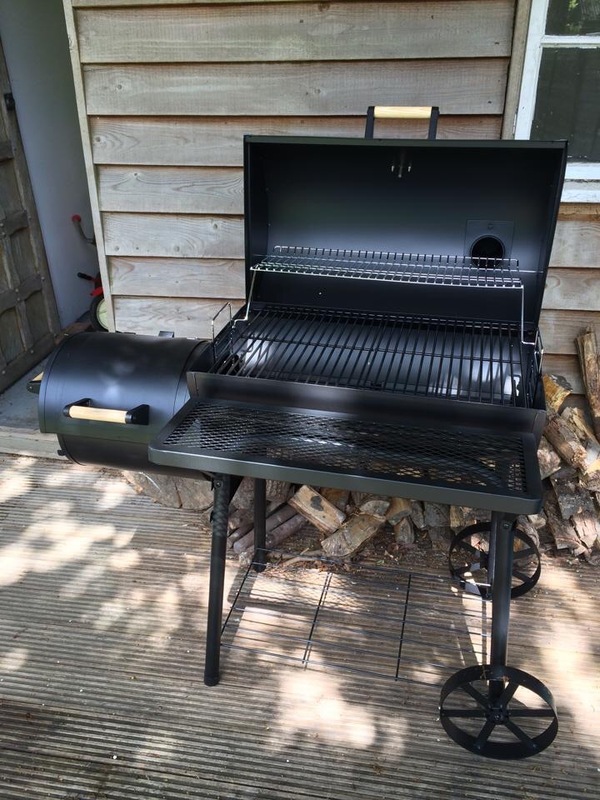 A proper coal barbecue with (cos we’re fancy like that) an offset smoker. We loved the idea of getting a hunk of meat and slow cooking it the way they do in the Deep South, ’til it’s charred on the outside and meltingly soft on the inside. I won’t lie, it’s not as simple to do as turning on a slow cooker and leaving it. It takes quite a bit of looking after, but both times we’ve done it it’s been simply amazing! When I posted the pictures of last night’s dinner so many people asked how we did it I thought I’d try and explain here. So I’m sure there are a hundred different ways to slow BBQ but we use an offset smoker barbecue. The idea is that the coals sit in that little attachment at the side. 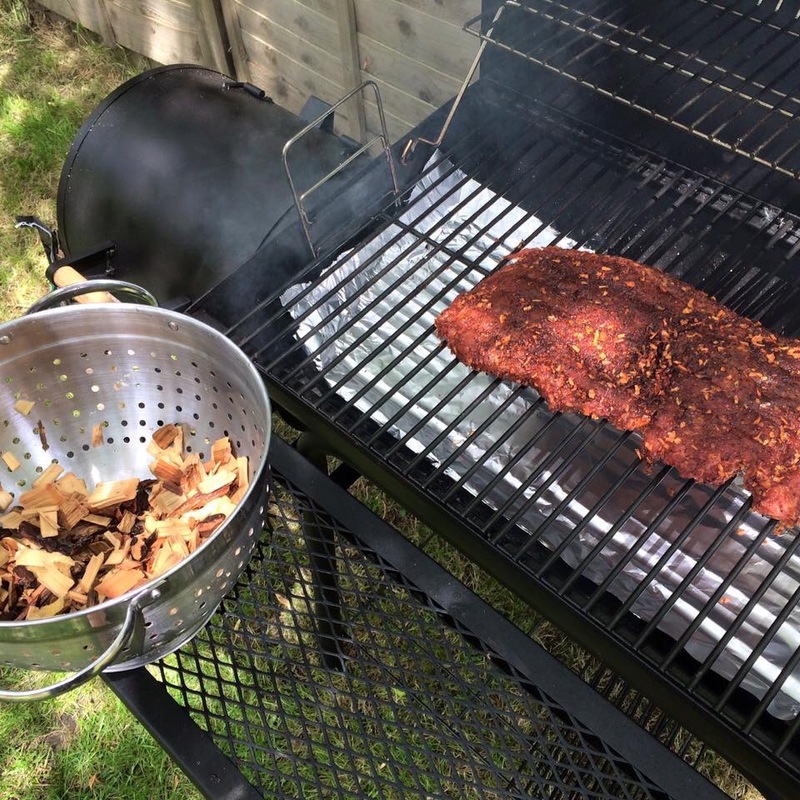 There’s a vent through to the main body of the BBQ and the heat, and the smoke from the wood chips, is pushed through, keeping the BBQ at a constant temperature over an extended period. Once the coals have heated the drum up to around 200 degrees F, we add a couple of handfuls of hickory wood chips (soaked in water for at least an hour beforehand), and the smoker is ready to start slow cooking. Once the meat is happily coated, place it on the grill, with any fat facing up. We coat the base of the drum in foil like this, as the meat drips as it cooks and it’d be a bugger to clean if we didn’t! Then close the lid. And keep it closed! The hardest part is not opening it to check the meat, but seriously, every time you open it you’ll lose heat and slow barbecuing is all about consistent temperature (in our case of around 200 degrees F or 120 degrees C). 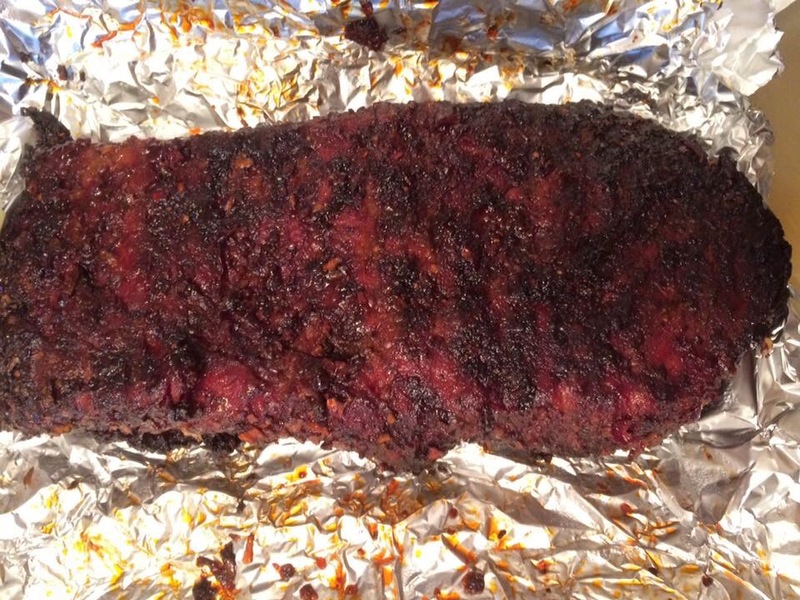 To achieve this you need to top up the coals in the smoker every hour, or hour and a half, of cooking. And the first three times you do that you should also add another handful or so of the soaked wood chips. Then let it do its thing, while you relax in the garden! How long it takes to cook will depend on the size of your piece of meat, but I reckon you’re looking at anything from four to eight hours. This size took about six hours and a smaller piece we did about five. When you think it’s done, it needs to come off the grill and rest. 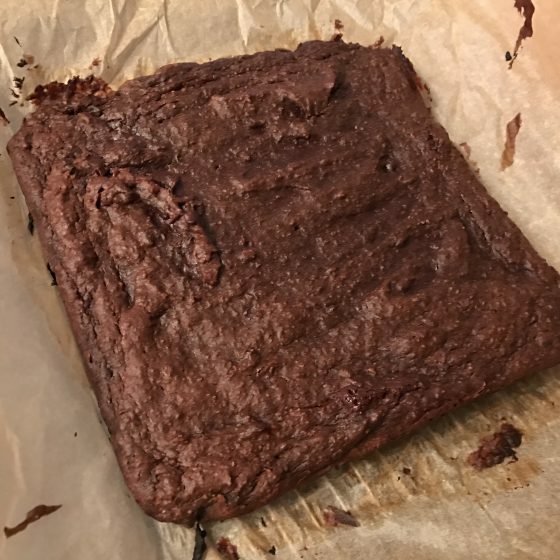 Honestly, if you don’t let it rest you won’t get the melting texture inside. 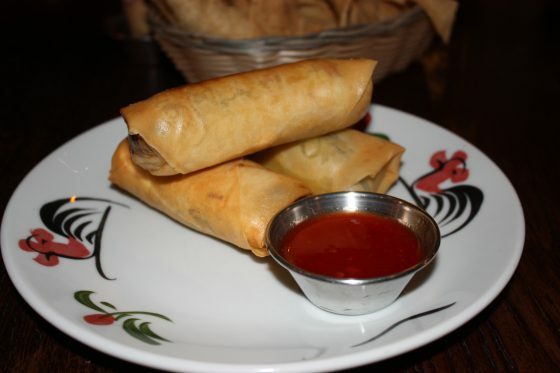 To keep it warm, we double wrapped ours in foil and then wrapped that in a tea towel. Again, resting time will depend, but we left it for at least half an hour and it was fine. When it’s rested, slice it as you would a roast and tuck the hell in! 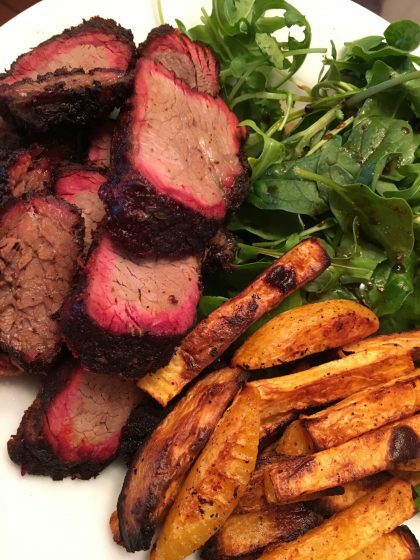 Last night’s dinner was BBQ brisket with balsamic dressed leaves and chilli swede chips. Yep you heard right; SWEDE chips. 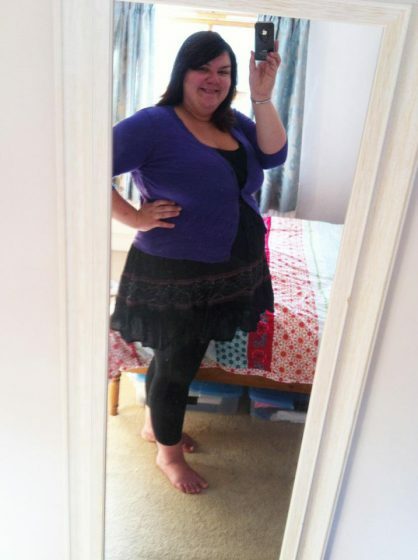 Someone suggested them at Slimming World last week, so I thought I’d give them a go and I can’t believe I’ve not done them before! Peel a raw swede, cut into thick slices and then cut into chips. Spray a oven tray with Frylight and add the chips. Spray again with Frylight, sprinkle with sea salt and dust with chilli powder (if you like chilli, omit if you don’t). Whack them in the oven at gas mark 9, 240 degrees C for 45 minutes, turning once or twice in the process. And voilà. Delicious, low carb (if you’re interested in that) chips. Perfect for an Extra Easy SP day. So there you go. 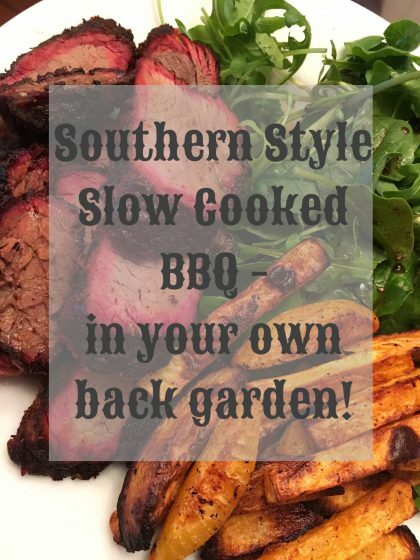 I’m not suggesting everyone run out and buy a smoker, but if you are interested in slow barbecuing with a standard BBQ a quick Google will come up with loads of suggestions of how to do it. I particularly liked this one. But if you’re in the market for a new BBQ, and fancy having a go at slow cooking, maybe consider one with a smoking function. Can’t wait until the weather’s good enough to do it again. Hmmm, what to slow cook next do you reckon?